Similarly to “AK103 PG” game set this “M16 M203” game set uses a unique firmware that allows using two optical systems simultaneously. Guaranteed shot distance of underbarrel grenade launcher is nearly 150 feet (50 meters) and it has 7-10 feet (2-3 meters) diameter beam hit spot, that makes it particularly effective while using in buildings. Reloading of underbarrel grenade launcher is made automatically (after 10 seconds by default) if the player does not shoot or recharge the main weapon during this period. You can easily change underbarrel settings using LASERWAR Laser Tag Configurator application in the “grenade launcher” section. You can change such parameters as the number of grenades, damage, recharging time and recoil time. Recoil time is the period during which the player cannot fire from his primary gun because of grenade launcher recoil. The weight of «M16 M203» is 10.14 lb. (4.6 kg). The optimal firing range is 400-650 feet (120-200 meters). The power button and the power jack are located in the gun buttstock and are protected with a hinged lid. The powered source is a Li + battery with 2,2 Ah capacity. Standard features include a detachable carrying handle that is mounted on Picatinny rail. 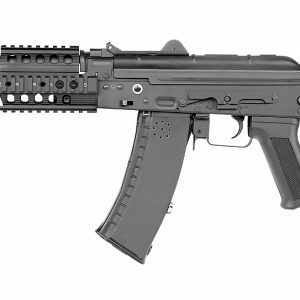 In addition, this gun has three such Picatinny rails that are located on the forearm and can be used for mounting of various additional equipment (the fourth rail is reserved for the grenade launcher).